As someone working off a teaching assistant (and soon to be university student)’s income, I don’t often go out of my way to purchase tools with only a single use or purpose. I grew up making bread at my mother’s hip, and since I was blessed with a high powered professional stand mixer as a gift, making bread (almost) every week has remained my passion. I’ve always loved artisan-crafted baked goods, and used to buy stone-ground flour from a local mill – which tasted fantastic but commanded a hefty price. When Sue Becker’s book The Essential Home-Ground Flour Book arrived on my doorstep, I was intrigued – although devoid of a mill. Luckily, this book managed to help solve that problem (and many others) along the way, all while offering inspirational recipes I couldn’t wait to try. So, you’ve decided to mill your own flour. Why, what type of mill should you choose, and just how do you go about it? Part One of Home Ground Flour is 93 pages worth of information on the subject, from the benefits of doing it at all (read: cost, nutrition and flavour) to the history of milling, suitable grains and finally the actual devices themselves. It was Chapter 4 – Tools and Equipment for Home Flour Milling (p.37) – that intrigued me the most. I knew about burr mills for coffee and spice grinding, but never used micronizing ones. If I win the lottery, one of those super-powered, lightning fast beasts is definitely on my wishlist! Instead, I lucked out with a great deal on a Mockmill, a stone-grinder style of attachment for my mixer – and the purchase of a (relatively) high priced tool is something no cookbook, blog or cooking show has ever convinced me to consider. Once equipped, and having read the entire first part (including the incredibly beneficial tip boxes lining the margins), I armed myself with a kilo of barley grains and got to work. According to Becker, I had enough grain to mill 6 cups of flour – which was almost dead on. I also tried my hand at grinding farro, spelt, brown rice and even lentils (note: don’t grind anything not approved by your mill’s manufacturer!). I transformed a bunch of the barley flour into various loaves of bread that weren’t found in this book, but immediately noticed a difference in the way the dough behaved and tasted. Freshly milled flour, provided the grains aren’t stale, made for a slightly sweeter, more tender loaf in my experience, and with cookies you could really taste the nuttiness of the grain all the way through (perfect with oatmeal doughs!). Finally, I got around to a few of my ear-marked choices in Home Ground Flour. The first was a batch of Apple Cinnamon Muffins (p. 182). I used a combination of locally milled sprouted wheat flour and home ground farro, which was a lovely complement to the flavours of the (again, local) honey that exclusively sweetens them. 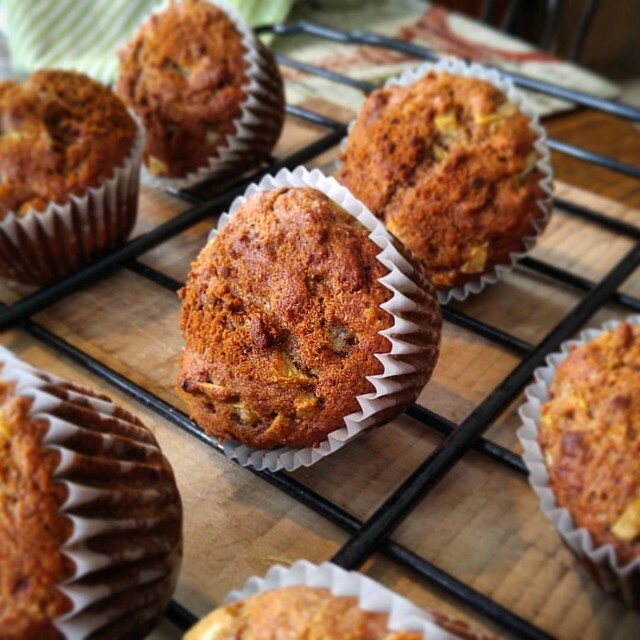 Each bite was peppered with bits of apple and the spice wasn’t overwhelming, which is always refreshing for a muffin recipe! 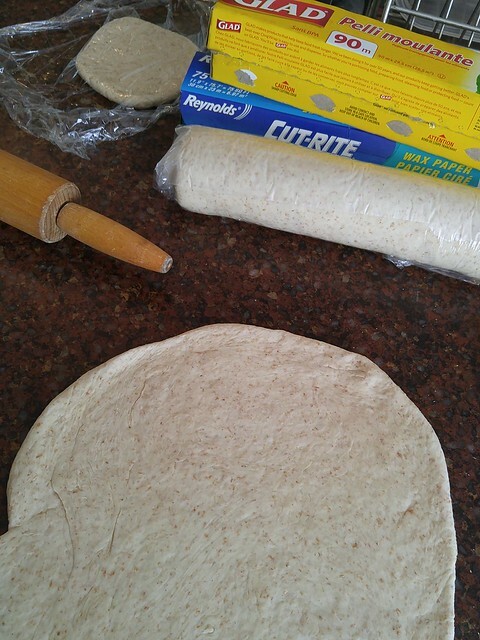 Next, as a preparation for one of my upcoming Home Economics classes, I made a few batches of Basic Whole Grain Pizza Dough (p. 174). If you need convincing as to how much yeast loves freshly exposed endosperm, this is the recipe – the dough rises impressively fast, and doesn’t taste unpleasantly “yeasty”. Even though there’s no sugar in the dough, the baked crust had a hint of malty, almost honey-like flavour. Definitely a keeper in my book. 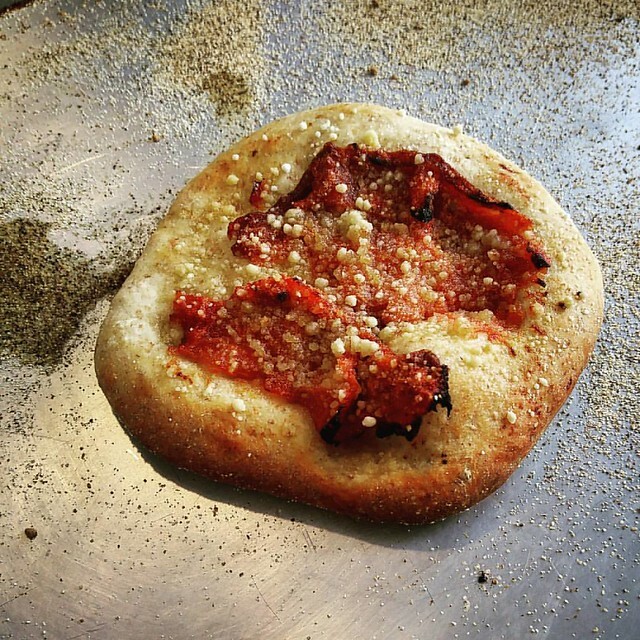 I can’t wait to keep experimenting with Sue Becker’s The Essential Home-Ground Flour Book. It has not only provided a solid base of information to start me off on my home grinding journey, but also opened my eyes to the true differences between the bag from the store and right from the grain. If you appreciate bread (making and eating), want to support local grain farmers or simply have a desire to eat more nutritiously, check this book out. You will not be disappointed. I want to get this book soon, it would be better if I get the book before Christmas day.I have already learned how to prepare these recipes at home.They may include the essay-company review so that the interested people could learn some more recipes which could be made at home.